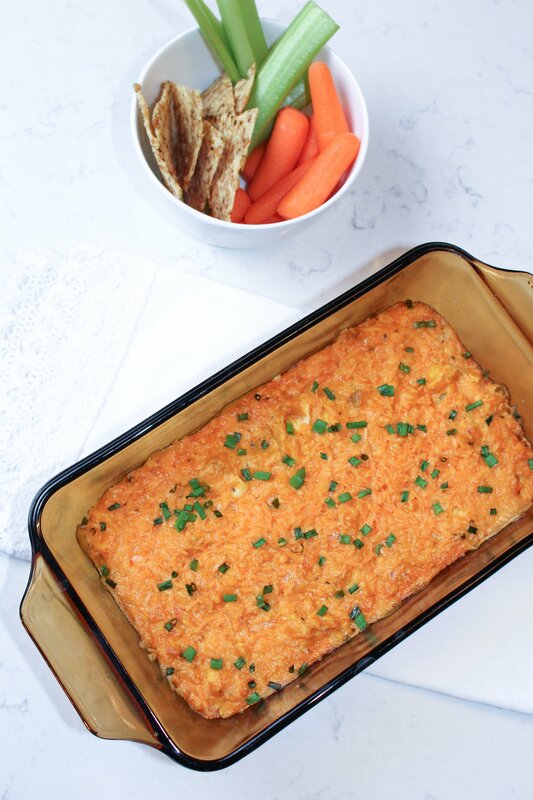 — I decided to make a Buffalo Chicken Dip yesterday! Since New Years Eve, I’ve been off dairy, refined sugar, coffee and alcohol. The plan was just to do it for a month after a crazy holiday season – but I feel so good right now, that I can’t bring myself to indulge! So I took inspo from my girlfriends recipes and made it my own — basically by just using what I already had on hand. Let me tell you, it was SO easy to make and did not disappoint! It truly tasted exactly like the original recipe, minus the dairy induced gut rot. 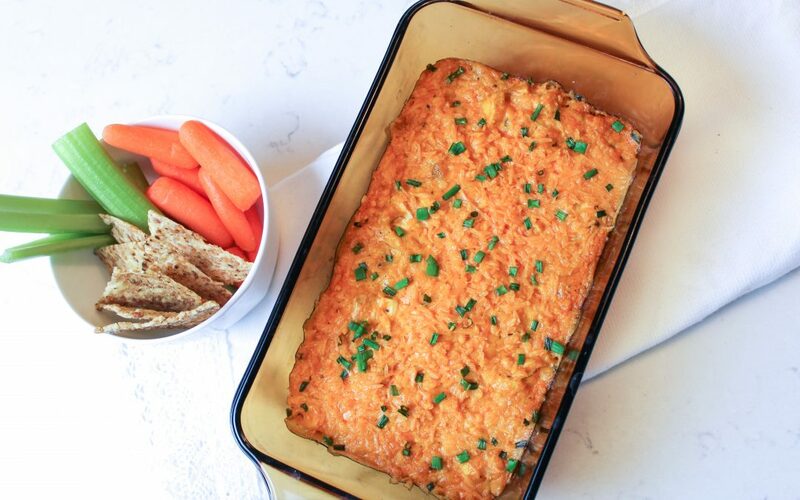 This is a perfect, healthified recipe that would be a crowd pleaser to serve at ANY party, not just the Super Bowl. If you make this, I’d love you to tag me on Instagram, @angelamcnally! I can’t wait to hear how you like it. *Note – this version serves 4. Double all ingredients to serve 8. 2. If you have cashew cream already, commit this step. If you have cashews instead, we need to make cream. You can soak overnight but I always forget! I simply put cashews in frying pan, cover with water and bring to a boil. About 5-10 minutes. Then strain cashews and pour them into the blender. You might needs to add about 1/4 cup of boiling water from kettle. Blend until creamy thick milk texture. 3. Sautee onion in oil and then add shredded/chopped chicken. 4. Turn off heat and pour cashew cream over chicken and onion mixture. Stir. 5. Add hot sauce. Start with 1/4 cup then taste and add more if you wish. 1/2 cup can be a little too spicy for some! Stir. 6. Add in a dash of salt, pepper and the nutritional yeast if you have it. 7. Stir in 1/4 cup of dairy free Cheese. 8. Transfer mixture to oven safe serving dish and place in preheated oven for 15 minutes. 9. Pull out and add remaining 1/4 cup of dairy free cheese as topping and green onion. Put back in over for another 10 minutes. Mixture should be bubbling on edges. 10. Let cool for 5-10 minutes. Serve with carrots, celery and rice tortillas.